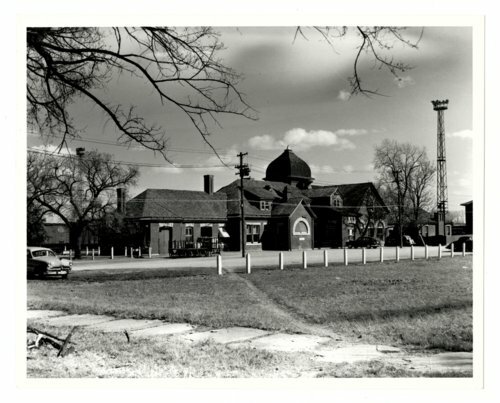 This photograph shows the Atchison, Topeka and Santa Fe Railway Company depot in Arkansas City, Kansas. The two-story, red-brick building completed in 1888 consisted of two waiting rooms, a dining room and a lunch counter. The depot was razed in 1950. A modern-style structure was dedicated at the same location on April 27, 1951. Atchison, Topeka and Santa Fe Railway Company depot, Arkansas City, Kansas.